The total Nameplate for all these 25 solar plants is 1820MW. 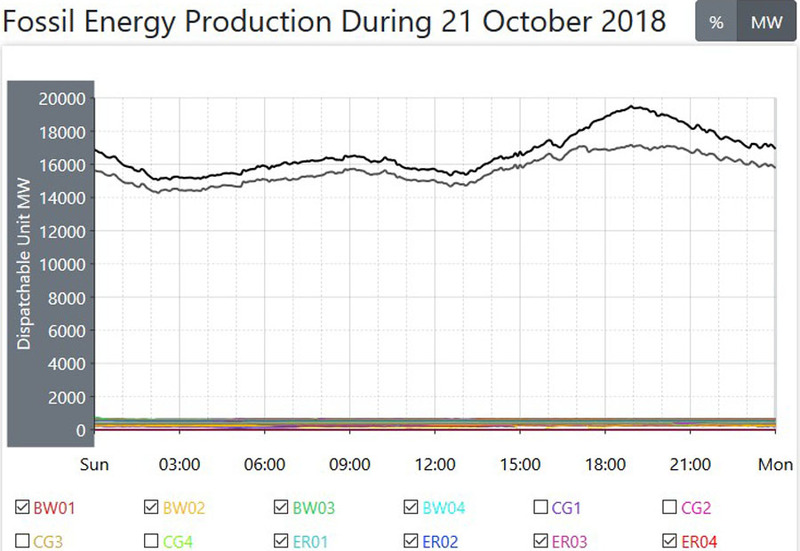 This was the Sunday of the weekend, and power consumption and generation figures were similar to what they were on the Saturday, with the average power generation just 100MW lower per hour than for the day before, and as is always the case, the mix of power delivery from the different sources varied wildly again. I have mentioned a couple of times now about the scale change of the graphs so that they fit neatly onto the page, and if you get used to just looking at those graphs, you could get the impression that they are similar from day to day. Again, for this day, I would again highlight that change of scale when it comes to some of those graphs. Look at the graph for wind power, and again it goes from a high near the top of the ‘page’ showing the graph, to a low close to the bottom. However, the scale has been changed here, because on this day, wind power was very low, as you can see from the data alongside that graph, so to highlight it showing that scale change to its best effect, I’ll show you the graph for wind power versus the total generated power for this day, and that’s the image at the right here, and again, if you click on this image (as with any of these images) it will open on a new page and at a larger size. The total generated power is the black line showing the Load Curve for all power generation across the top of the graph, and wind power is the green coloured area you can see just bumping along the bottom of that graph. The average for wind power across the day was only 510MW per hour, giving it a daily operational Capacity Factor of only 9.4%, so less than one in ten of those thousands of wind towers across the Country were delivering power on this day, and wind only delivered 2.6% of the power required during this day. 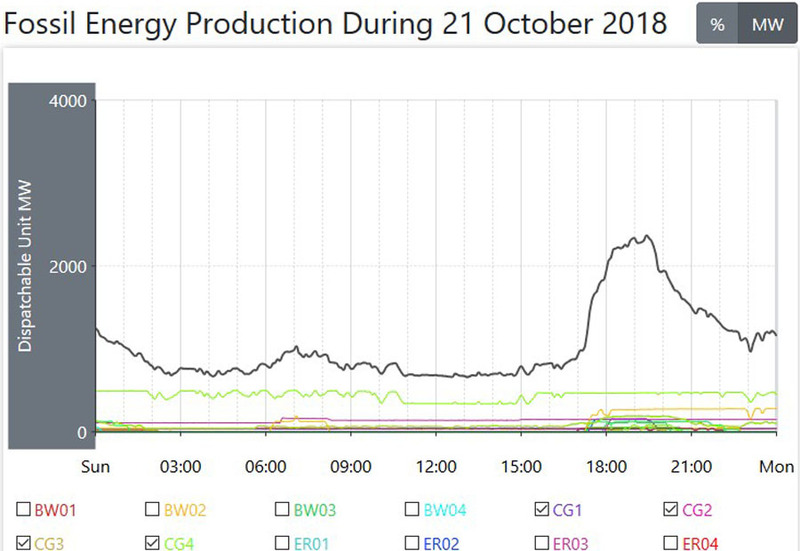 Note also that at the low point for wind power at quarter to five, just as power consumption was beginning to ramp up towards the evening Peak, wind was only delivering 240MW of that, or 1.16% of what was actually required at that time. The average for power generation was higher on the day, and on a day when overall power generation fell by 100MW, that average for coal fired power rose by a significant 1190MW. One of those Units down for maintenance came back on line during the afternoon, and now there are nine Units off line. 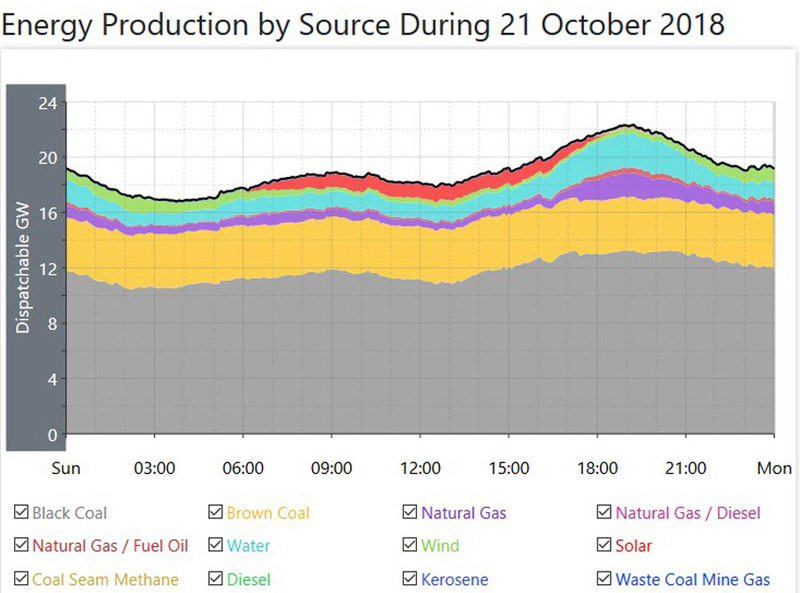 Because coal fired power was way up on the day, and with wind power down by so much, the averages for natural gas fired power and hydro power were the same as what they were for the day before. 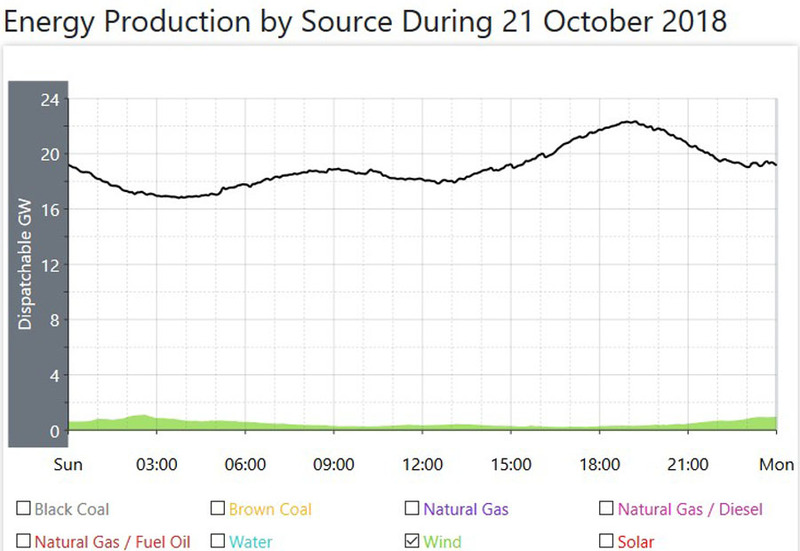 The average for solar power was up as well, but hey, when it id only delivering 2% of what is required, who really cares, as it is all but inconsequential. 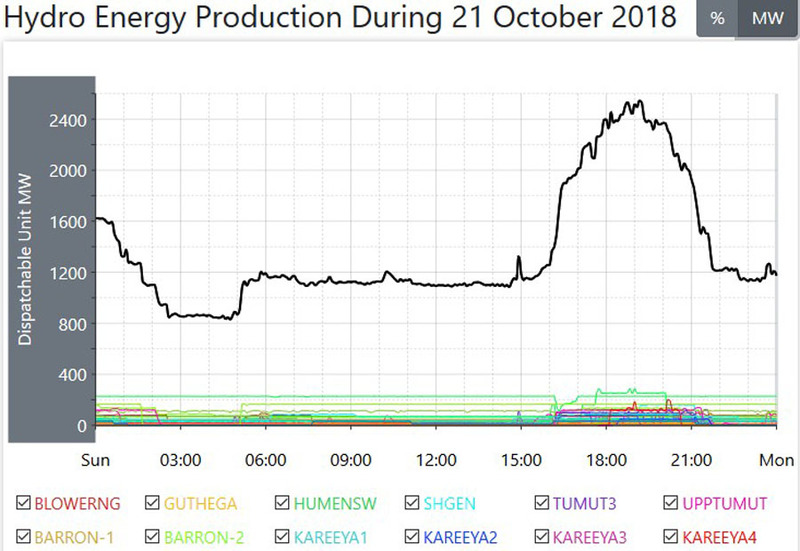 And also, if those other sources are touted as being so cheap, why then did they use more coal fired power on this day than for any other day this last week or more, as coal fired power delivered a whopping 81.25% of all the generated power across the Country. WEEKLY DATA For Week Three. Hydro, Wind and Solar add up to the total for Renewable. For the first Rolling Total, Rooftop Solar Power (which is behind the meter) is a percentage of the overall total and on top of that total. For the second Rolling Total, Rooftop Solar Power is added to the total overall power generation, and new percentages are calculated from that new overall total. Total Generated Power is expressed here as GWH (GigaWattHours) and a GWH is a MWH (MegaWattHour) multiplied by 1000. 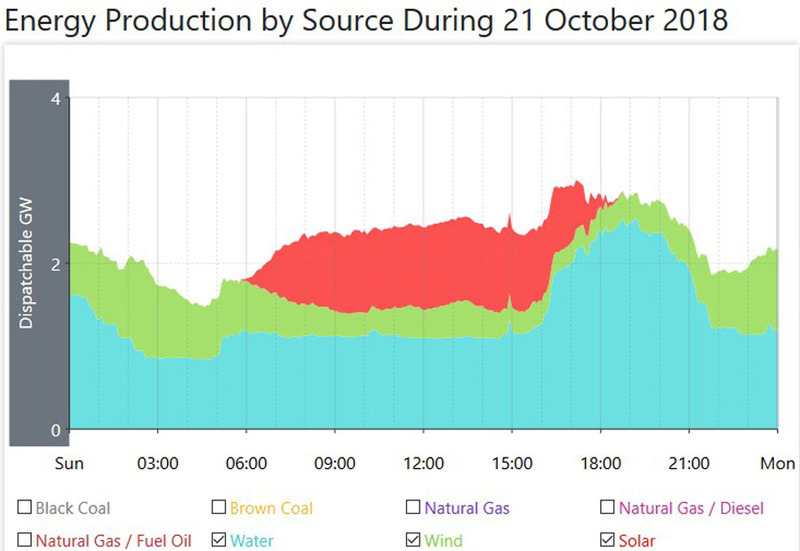 The total power generation for this week was a little lower than for the previous week, but only by 1.4%, and while remarkably similar, the mix of power delivered from the different sources changed, as you might expect. The total power delivered by coal fired power was down by 3.5%, and the main reason for that is that those coal fired plants are taking this opportunity of (expected for this time of year) lower power consumption to schedule maintenance for their Units before the ramping up of consumption in the coming Summer. 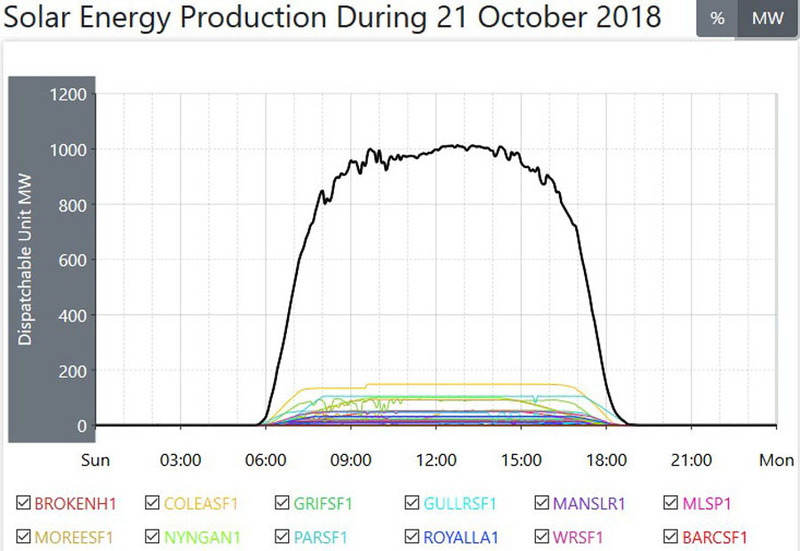 To that end, there wer between 9 and 12 Units off line for the whole of the week, and that takes almost one quarter of all coal fired power out of the system. While the average for renewable power changed very little, again, the mix changed. Wind power had a good week the week before this one, and this week was only just average, and with hydro up slightly, and solar power up a little as Summer approaches, then that average for renewable showed only a minor change. The total power delivered from wind power gave wind an operational Capacity Factor for the week of just under 35%, still a little higher than the year round average of 30%. Even with so many Units off line, coal fired power still delivered over 73% of all the power required. These Rolling Totals are showing signs of settling down, even after only three weeks, and the changes are only in the tenths of a percent margin now. 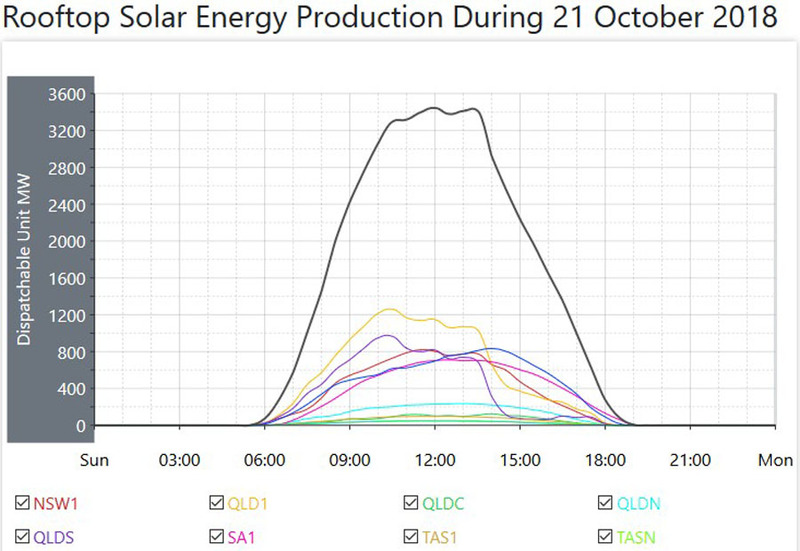 Both versions of solar power are slightly increasing with each week now, but note here that they are still only delivering very small percentages of the total, with the power delivered from those solar plants still only just higher than one percent of what is required. That total power delivered from wind power gives wind an operational Capacity Factor after three weeks of 33.5%. 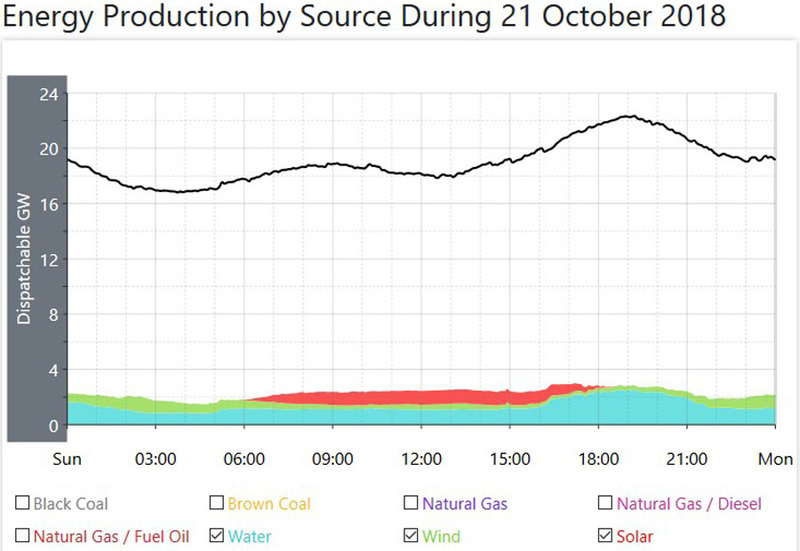 Coal fired power is still averaging 72% of all the required power to run the Country. Thanks Tony. One thing of interest – last three weeks averaging 3690 GWh/week whereas your previous 13 week average through winter was 4099 GWh/week. So that shows demand down by 10% from winter to spring, before we ramp up again for summer. Or in MW, currently about 22,000 MW, was 24,400 MW. Robber, thanks for this comment. 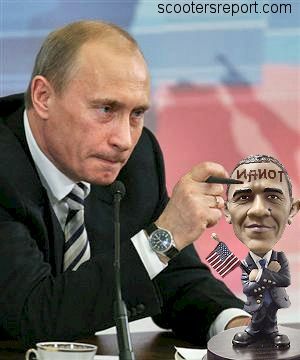 I’m glad you picked that up. It’s something a lot of people miss. When you see data as gathered only at the end of the year by the Government Department, all it mentions is the overall total power generation for the year, and (perhaps) some text indicating that consumption is a little higher in Summer and Winter, but no real indication as to by how much that variation actually is. The fact that it is such a large difference (and it is closer to 12 to 13% higher) is glossed over. 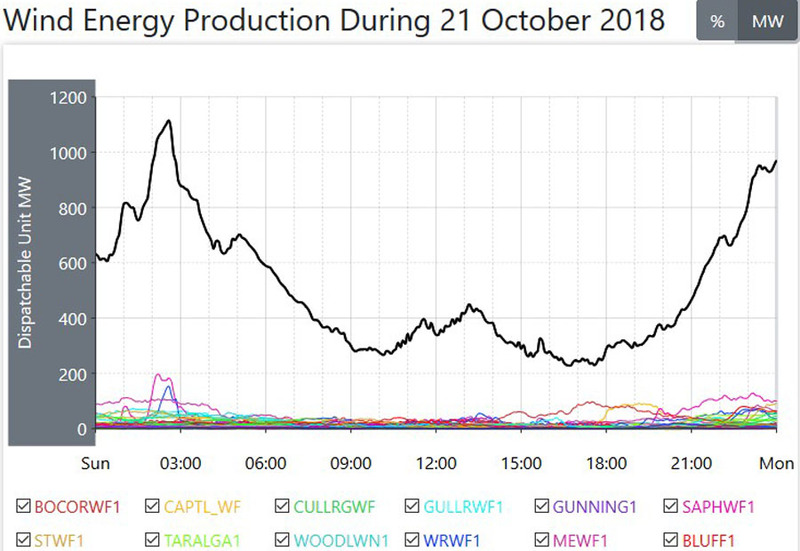 The biggest ‘end result’ of that difference is what is currently happening now, (in the Australian Spring) and what also happens in the Autumn as well, is that lowering of that large amount of power, and that’s around 2500 to 3000MW, is that during these benign Months, those coal fired Units go off line for scheduled maintenance on a rotational basis, very carefully planned so as not too many Units are off line at the same time. There are currently ten Units down, and it averages between nine and twelve for these 8 weeks or so in Mid Spring. 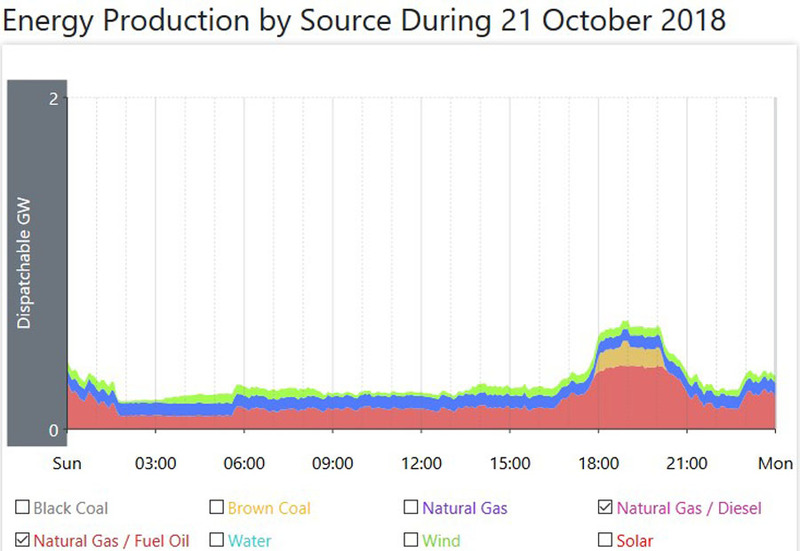 That withdrawal of power comes in at around 3500MW at any one time, and notice how close that is to the overall lowering, again conclusively showing how reliant we are on coal fired power, as that is the only source they are withdrawing from service. What is also not particularly noticed is that the lowering of power on that overall Seasonal basis also occurs on a weekly basis as well. Power consumption is significantly lower on weekends as opposed to week days, and that comes in at around 2000MW lower, between 9 and 11% lower. Just watching this power data on a daily basis provides so many insights you don’t see from looking at the Government produced end of year data. My task then becomes to explain it to the average person so they can understand it all.